Combine all ingredients except oil in large bowl; mix well. Shape into 36 (1-inch) balls. *Note: To freeze, cool completely and place in gallon-size resealable food storage bag. Release any excess air from bag and seal. Freeze bag flat for easier storage and faster thawing. This will also allow you to remove as many meatballs as needed without them sticking together. 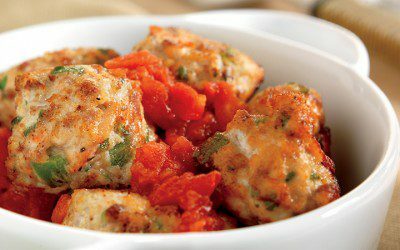 To reheat, place meatballs in a 12×8-inch microwavable dish and cook on HIGH 20 to 30 seconds or until hot. Serving suggestion: Top with a lower-sodium meatless marinara sauce. Exchanges per serving: 1/2 Fat, 1 Vegetable, 2 Meat.